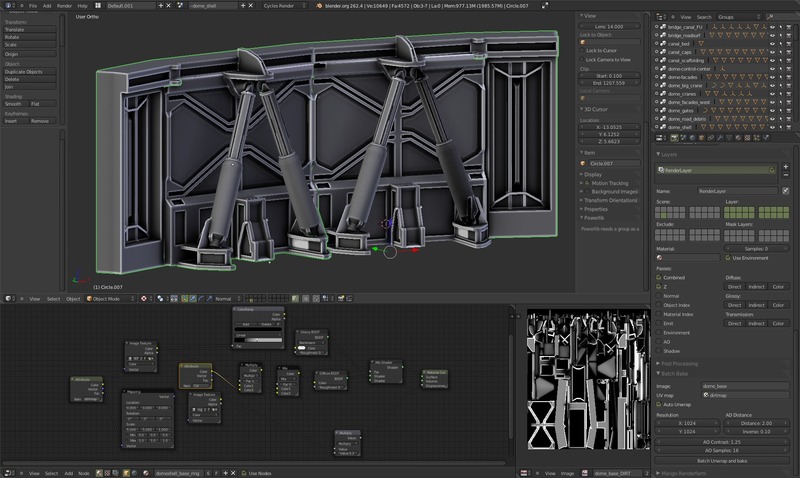 The 2 screenshots below show a typical sci-fi-industrial-metal environment prop (it’s a module of the base ring of the dome). the more ‘organic’ objects (old buildings, wood and stone) are proving more complicate and require individual solutions … but big misc machinery with an industrial-sci-fi look ? Those can be made reliably with almost always the same modelling and shading tecniques. 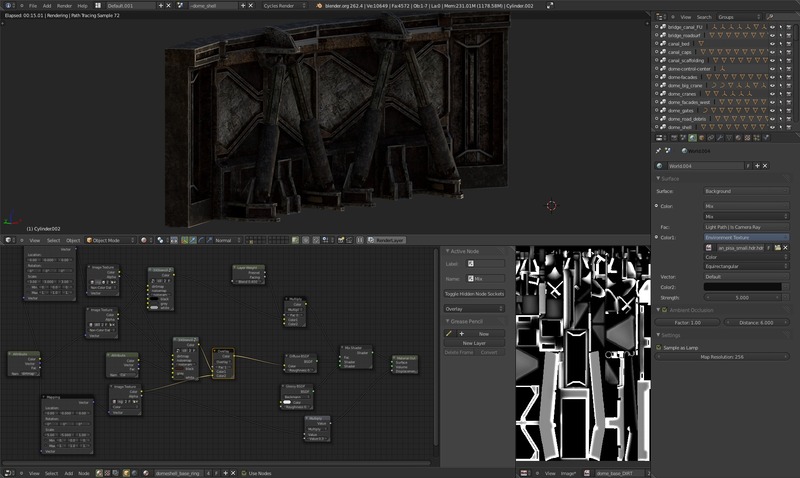 This uses the batchbake and 3-steps stencil node I’ve posted about earlier, and very soon I’ll be able to check with the others (devs and artists) how well this is working and what tweaks it might require (but it should prove efficient for memory in large scenes and flexible to tweak for specific shots or depending on the rendering needs ). 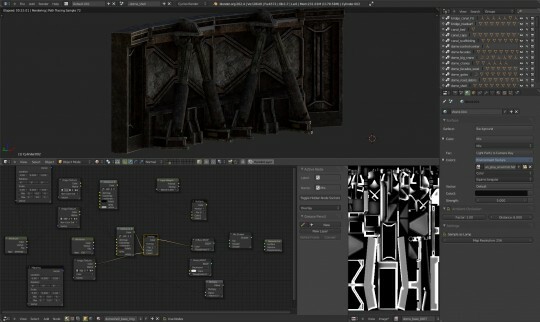 As you can imagine, it would make sense to think of modelling and texturing , then care about shaders and materials later, when the lighting is being done … But, for these environment pieces, you can’t really expect to have custom unwrapped, non-tiling UVs for everything and col/spec/bump maps for every indivudual object (nor it is technically convenient for memory and texture resolution), so ‘texturing’ is more about making tileable, reusable textures and set them up in materials that can be later tweak to respond to light as needed. Of course some custom painted maps are necessary , but -combined with tileables- is often enough (or better) to use vertex color for AO and base color , and low-res bitmap masks (i.e. to mix broken plaster and bricks). Something that is proving very useful is kits of standard objects like : metal beams, broken concrete pillars, wood planks. 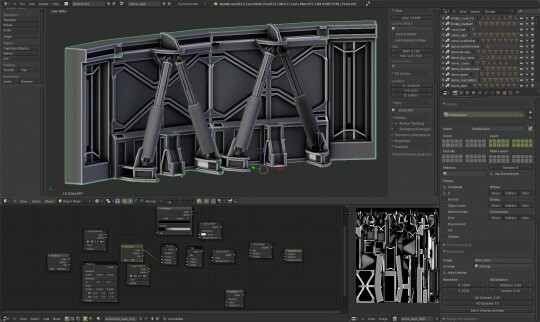 Once they’re setup, each piece can be grouped , linked into scenes and reused 1000 of times , but still be editable in a library blendfile where shading and modelling can be easily tweaked or redone completely. anyway! great work guys!! looks amazing! The dome is currently around 6,5 million polies at rendertime. For maps i start by default at 2k (2048×2048) and resize to 1k later if necessary , i often use 4k for tileable, reusable textures. But at some point , when all the maps are there, we’ll prob. resize lots of dirtmaps -from the batchbake script- to smaller sizes like 512. For linking , i’ve just finished refactoring the groups so it now works with Francesco and Olivier’s Powerlib script : meaning you link the dome into shot files as a single group and you can then hide pieces and change detail level. Is the dome inspired from Paul Debevec’s light stage? Cycles needs to get a new, good prime lens; that chromatic aberration…! Actually, I think the chromatic aberration is added in compositing. Might be wrong, but I havent encountered it when using Cycles. Not specifically related to this post, but have I told you guys that I’m addicted to this blog? I think I check it more often then my mail, and that’s saying something. I think it all looses proportions, everything seems to be a small model of a real-size structure, for instance wall breaks seem to be cut in a cardbox therefore they look unnatural, cables are too thick comparing to buildings, church looks like a primitive toy-like recreation of something real. Moreover I’m really interested how Cycles will handle such interiors, I know these are test renders but the amount of noise and fireflies is quite large. Just wait for the angles! just wait for realistic ones and the size will definetly get clear. thanks, as you say these angles are just showing as much as possible. Good point about the cables ..there’s no realworld counterpart for such a thing to say they’re too big, but still making them bundles or smaller cables could be more convincing. And also about scale, it makes me think i should take care for parts of the dome where there’s no buildings close-by to have stuff like gangways and ladders to give a human scale reference.